Loomstate !Act Natural! 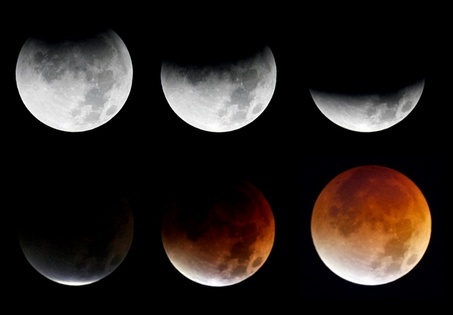 Blog: Winter Solstice & Lunar Eclipse Tonight! Winter Solstice & Lunar Eclipse Tonight! Don't miss tonight's luminous spectacle, unless you will be around for another 632 years from now. This very rare overlapping of events - the winter solstice (today) and a lunar eclipse (tonight, but happens every few years) - will be visible to just about all North American and western South American stargazers and is a great way to enjoy the darkest day of the year. It is also a special event that can be viewed from even the most well-let corners of the city, not just from rural backyards. An eclipse happens when the moon, Earth and sun all line up, with the Earth in the middle. 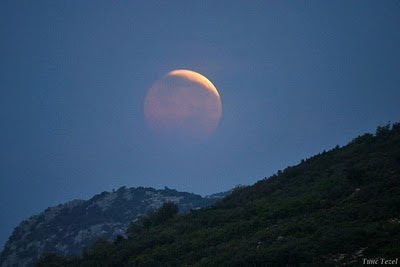 The color of the moon will be an orangey hue from the sun's rays filtering through Earth's dusty atmosphere. The eclipse will start around 1am, with the total eclipse at 2:41am. If you are up in the wee hours of the night, you will have 70 minutes to step out of the bar or bundle up and head out on your fire escape to view this. Otherwise, the next total lunar eclipse viewable in North America will be in April, 2014. For more info on lunar eclipses.